When an alkyl group is attached to an unsaturated system such as double bond or a benzene ring, the order of inductive effect is actually reversed.This effect is called hyperconjugation effect or Baker-Nathan effect. Resonance effect involves delocalization of π-electrons of two or more conjugated bonds or π-electrons of a double bond and non-bonding i.e. n-electrons of a hetero atom, hyperconjugation involve delocalization of σ-electrons through overlapping of p-orbitals of double bond with σ-orbitals of the adjacent single bond. 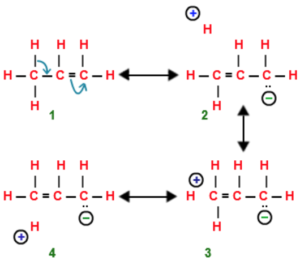 Structure 2,3,4 are called hyperconjugative structures.Since there is no bond between carbon and hydrogen atom in these structures, hyperconjugation is also called no bond resonance. Although a free proton has been shown in the above structure , it is still bound quite firmly to the π-cloud and hence is not free to move. Hyperconjugation occurs through H-atoms present on the carbon atom next to the double bond, i.e. α-hydrogen atoms. More the number of such α-hydrogen atoms, more are the number of hyperconjugative structures and hence greater is the inductive effect. The number of hydrogen atoms is three with methyl group, two with ethyl group , one with isopropyl group and none with tert-butyl group. Directive influence of alkyl group : The o,p -directive influence of CH3 and other alkyl groups can be easily explained on the basis of hyperconjugation. As a result of hyperconjugation , the electron density at o and p position w.r.t. the CH3 group increases and hence the electrophilic substitution reaction in toulene will occur at o and p position w.r.t. the CH3 .Thus alkyl group are o,p directing. 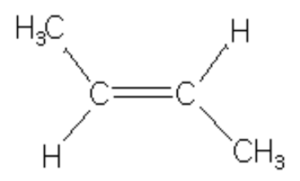 As a result of hyperconjugation, C-C single bond in propene acquires some double bond character and hence is little shorter than the normal carbon-carbon single bond length in propane. Heats of hydrogenation show that greater the number of alkyl group attached to the doubly bonded carbon atom , greater is the stability of the alkene. Greater the number of hyperconjugation structures, more stable is the alkene. trans-but-2-ene is more stable than cis-but-2-ene in which the two methyl group are close together and hence their electronic clouds repel each other.